Cork is made from the bark of an oak tree that grows in the areas surrounding the Mediterranean. The small European country of Portugal is the leading grower and producer of cork worldwide. Portugal's cork production has a long, venerable history. Southern Portugal boasts over 5 million acres of oak forests. Cork is harvested by removal of the bark of the cork oak (Quercus Suber), a medium sized tree with thick, lightweight bark. The process of taking cork from the tree has been compared to shearing sheep. It leaves the tree entirely intact and unharmed and able to continue growing and regenerating cork bark for the remainder of its 150- to 250-year life cycle. Approximately every 9 years, the tree can be re-harvested... It is truly the tree that keeps on giving! 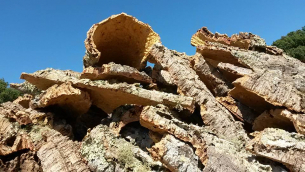 Cork oaks are a protected plant species in Portugal, so the harvesting process is strictly regulated and highly sustainable.